A lot has changed over the last 19 years. We have seen the global economy tank, cell phones everywhere, tons of people use the internet (and even know what it is), and we stream high-definition video to mobile phone. In 1993 a 1GB hard drive was unheard of, let alone the terabyte drives we have today. In 1993 a new My Bloody Valentine album was “in the pipeline, and it will be completed very soon” and this was still somewhat plausible, and a group of guys calling themselves Sector 9 were making longboard skateboards in their backyard in La Jolia, California. Flash forward 19 years, and Sector 9 has grown into one of the most influential skateboard companies around in the world of longboarding. This is because of their constant commitment to quality. The Sector 9 Aperture Sidewinder Complete continues this tradition of their quality. 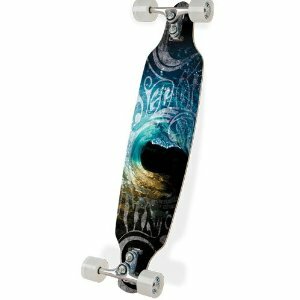 The Sector 9 Aperture Sidewinder Complete longboard is 36” long, which is not the longest deck Sector 9 offers, but still long enough to keep you stable when you are going downhill at high speeds. It has an interesting shape to it, with a very tapered nose and tail. From a looks perspective, I don’t find the shape very attractive, but there is a definite benefit to it. More on that later. Before we get into that, I should mention the graphics on this deck, since this can often times matter a lot more than the board itself to people. It is an abstract pattern, and not really my cup of tea, but it looks really nice and is quite well done. Now, onto the actual shape of the board. When I first saw it I thought, “no sir, I don’t like it.” I prefer my skateboards to have a proper tail and a proper nose. There is a very good reason for this shape though, and that is because of the Sector 9 Gullwing Sidewinder trucks. The biggest selling point and the best thing about this board has got to be the Sidewinder trucks. Only available on certain Sector 9 boards that are appropriately shaped, like the Sector 9 Aperture Sidewinder Complete, the Sidewinder trucks have a double pivot that allow them to turn a lot sharper and a lot faster than standard trucks. You can generate a lot of speed with these using only your turning momentum. It is pretty amazing what a difference these trucks make. The Sector 9 Aperture Sidewinder Complete is an amazing longboard, all thanks to the Gullwing Sidewinder trucks. The shape of them necessitates the odd shape of the board, and it works quite well. It remains incredibly stable even at high speeds, which are nice and easy to achieve. If you are looking for the ultimate sidewalk surfing experience, look no further. This board is currently priced at just under $190 on Amazon. This entry was posted in Reviews, Sector 9, Skateboarding, Skateboards and tagged Longboard, Sector 9. Bookmark the permalink.